In recent weeks I’ve dwelt on general finance strategy as we navigate this turbulent Modern season. 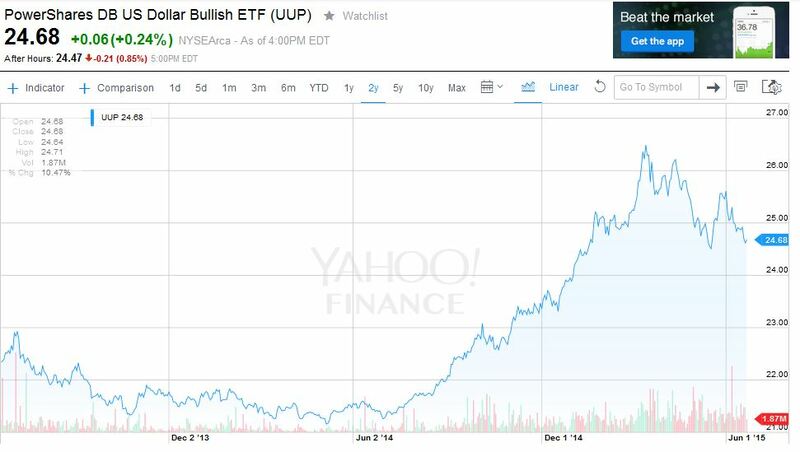 I suggested trading out of Modern staples as they spike and acquiring some higher end, safer MTG investments. I also touched upon my emotional rationale for abandoning Modern – at least in the short term – to move into a format I am more excited to play. I had planned on writing an even more bearish article about Modern this week. In fact, I was planning on making the bold claim that Modern was at a local “top.” Prices are destined to fall from here, right? YES. Very yes. I applaud Travis for sharing his bold and potentially unpopular opinion that Modern has topped. Frankly, I couldn’t agree more. Let’s assume you’ll consider what Travis has said, and that you’ll sell a lot of your recently inflated Modern staples. You know the ones I’m referring to: your $90 Snapcaster Mages, $50 Blood Moons, $15 Serum Visions, and $5 Lantern of Insights. The decision to sell cards like these would generate a sizable cash position. So what do you do with all these newfound profits? Sitting on cash seems miserable, so there must be a better place to park resources right? Well, you could try and acquire Modern staples which haven’t spiked yet. I can think of a few viable examples: consider Tendo Ice Bridge, which is already practically sold out across the internet (Disclaimer: I have 1 copy listed for sale at an artificially high price in case this spikes). Worldspine Wurm is another example. The card was a four-of next to Nourishing Shoal in the creative reconfiguration of the Goryo’s Vengeance strategy. While Shoal went from $0.75 to $15, the Wurm barely moved a muscle. Guess which one is likely to have more casual appeal, by the way. Despite these and a few other ideas, I don’t believe Modern is where you want to invest your recent profits. Even if these ideas do move higher, they’ll be facing headwinds all summer as the format quiets down. Better opportunities exist. I can think of lower risk propositions with immediate upside potential. In fact I can think of a number of ways you could apply some capital and generate immediate returns even by buy listing, and it doesn’t require collection buying. I enjoy relating MTG Finance to stock market investing. I detect many parallels between the two, despite some dissonant opinions amongst the community. At last, this knowledge may provide actionable benefit. It all relates back to the strong US Dollar. Since mid-2013, the US Dollar has been on an absolute tear jumping in value by 15-20%. This, paired with recent weakness in the Euro, has led to some very favorable exchange rates for the arbitrage seeker. The result: cards – especially high end cards – for sale in international markets are now more attractively priced. While the US Dollar has pulled back from its highs a few months ago, those in the U.S. still have a clear advantage. I have a couple specific examples I can share. First, if you have a friend you can trust in Europe then I’d highly encourage you to explore Magic Card Market (www.magiccardmarket.eu). Through a quick search, I readily found an arbitrage opportunity with Beta Scrublands. One seller has a NM copy listed at 599 euros ($680 USD). If truly Near Mint, Star City Games will buy that same card from you for $900. Card Kingdom would even pay $910. I’m confident there are many other opportunities on the site if you’re willing to spend some time searching. I’d recommend looking at other high end staples such as these. Don’t have a friend in Europe? No problem! 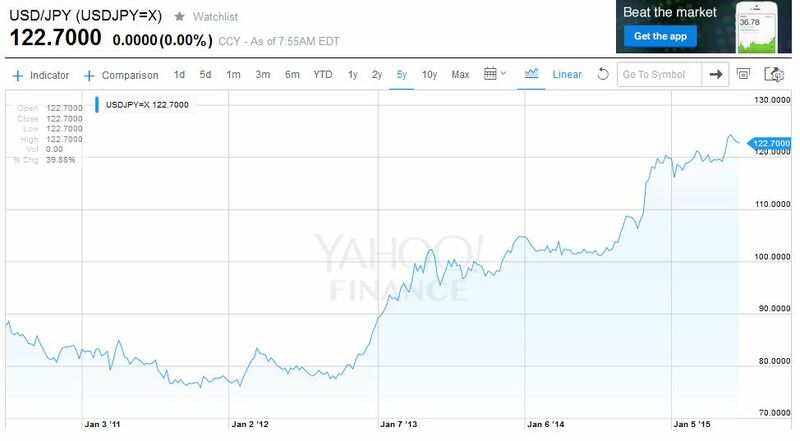 Today your US Dollar can purchase more Japanese Yen than any time since 2011! The implications to this are huge, if you are willing to buy from Japanese vendors. The good news is many Japanese vendors will ship directly to the U.S. One site I would immediately trust is Saito’s digital store front, http://www.hareruyamtg.com/en/. 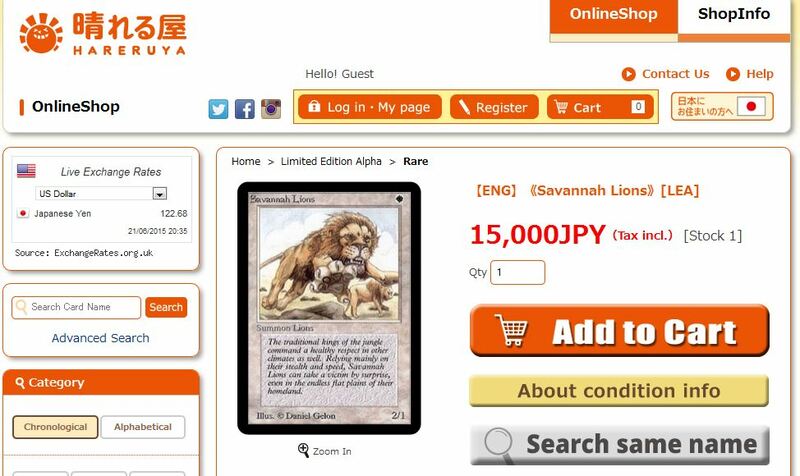 Using the exchange rate Hareruya generously provides, you can purchase an Alpha Savannah Lions for $123 + shipping. 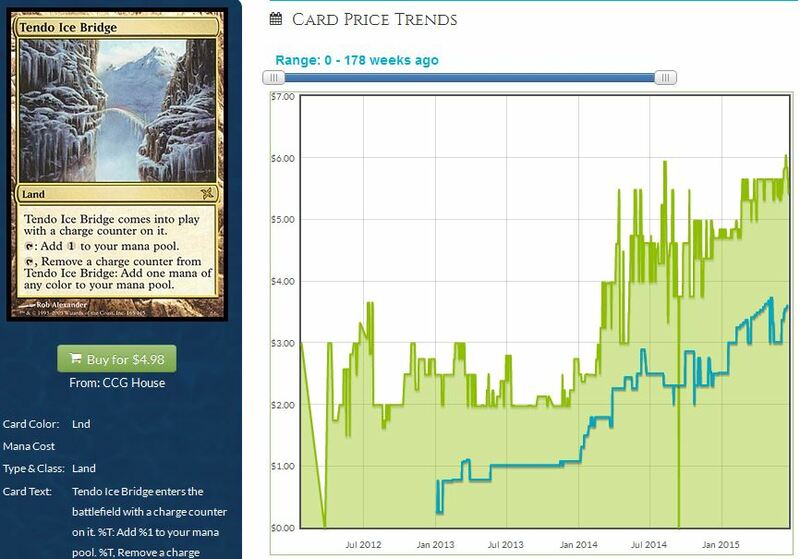 Channel Fireball is paying $125 for the same card, and Card Kingdom is paying even more: $135. In this particular example no immediate opportunity exists. Shipping will cause this deal to fall short of immediate profit (though I have requested scans of the card – it truly looks Near Mint). But there is a right to succeed here. I know of a few other solid opportunities on this same site by simply running searches. Putting together a larger purchase could help you overcome shipping costs, enabling arbitrage or, at the very least, very good deals! I must acknowledge this article is highly geared toward the US investor. In reality, there are opportunities for everyone to get involved. People in Europe can engage with those in the U.S. to help identify opportunities in the European market. The same goes for those in Asia who have access to the Japanese market. We can all work together and benefit from the gap that exists across continents. I would also be remiss if I didn’t at least briefly touch on the risks associated with this endeavor. Shipping costs and condition are a huge factor – it’s not cheap to move cards over oceans, especially in quantity. And although a picture is worth a thousand words, it could also cost you a thousand dollars if it’s not high enough quality, causing you to mis-grade a card before buying. There are also currency conversion fees you need to consider. These are all powerful reasons for why opportunities are still aplenty. The risk is sizable and real. But so are the opportunities. And if international deals aren’t your forte, consider some local “arbitrage” opportunities. High end cards can be very difficult to price correctly if you’re not heavily involved in this space. 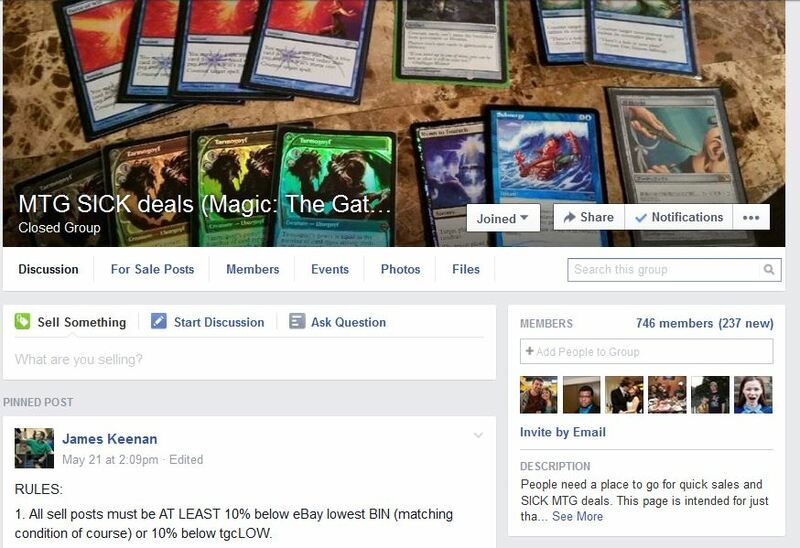 By searching one of the billion MTG Facebook groups, you may come across a steal. A friend directed me to a particular Facebook group focused solely on “sick deals”. 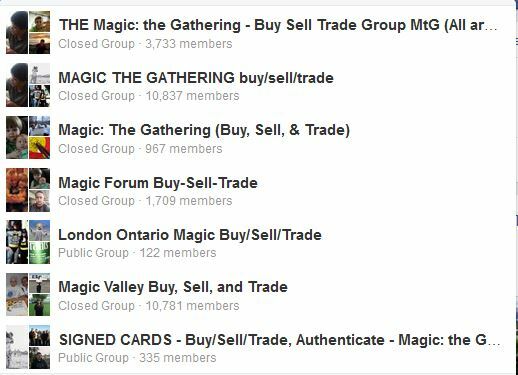 That’s right – you can’t list a card for sale in that group unless you’re at least 10% below eBay / TCG low pricing. If you don’t like international orders and you don’t like Facebook, I have one last idea of how you can find attractive deals. I have one word for you: misspellings. Check out the website www.fatfingers.co.uk. This website allows you to search every country’s eBay site for common misspellings of eBay listings. I was skeptical at first, until I tried it out. Believe me when I say, this site works. 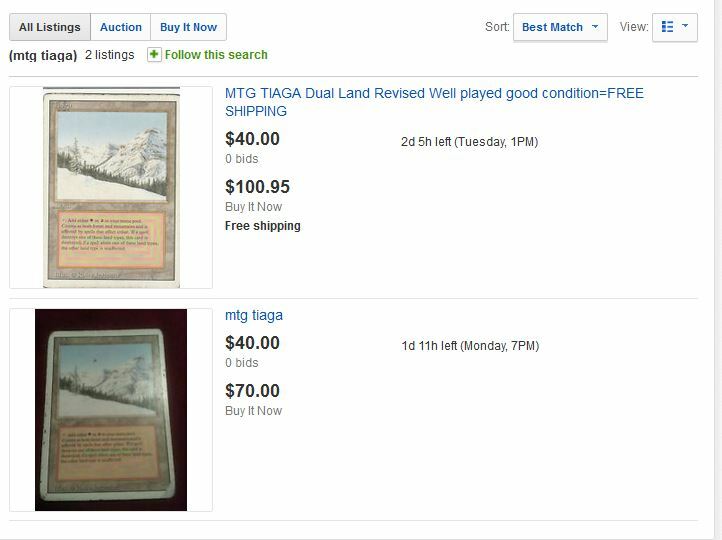 These Taiga prices may not be the most attractive, especially given their poor condition, but the proof of concept is still there. Notice how both these listings currently have 0 bids? That’s probably because only a handful of people have actually seen these listings. If nothing else, the site can be very entertaining – you’d be amazed at the many ways some of these Magic cards can be misspelled! With spring’s Modern GP behind us, perhaps we are once again seeing a peak in Modern staples. If this is true, the time to sell could be right now. I have been moving out of Modern very actively in recent weeks, putting my money into older, more stable cards. If history repeats itself, we could see a price bump on stuff like Dual Lands and Legacy staples later this summer or early fall. And even if we don’t see a sudden spike, these are still very solid cards to park your money. You could do much worse with your recent profits. If you feel like trying something new, give a gander to the websites I mentioned above. The strong US Dollar can drive some very attractive deals on international sites – especially in Europe and Japan where currencies are particularly weak. While I haven’t pulled the trigger just yet on these opportunities, I have been watching them closely in recent weeks. Once I accrue some additional capital I just may make my move. Just proceed cautiously, as there are risks associated with buying internationally. Fortunately those risks can be reduced by placing larger purchases to overcome shipping costs, and asking for card scans before buying. Using common sense, you should be able to navigate the pitfalls of international buying, leading you to profitable arbitrage opportunities. At the very least, consider international shops (even just north of us in Canada) when looking for attractive prices driven by currency exchange. And if you insist on staying domestic, give the Facebook groups a try. You never know what deals you may discover. I’m not kidding when I say Tendo Ice Bridge is all but sold out on the internet. I see 3 copies on TCG Player and a couple on eBay and not much else. Star City Games is currently sold out at $5.85 but I suspect they’ll relist higher when they do get more copies in stock. 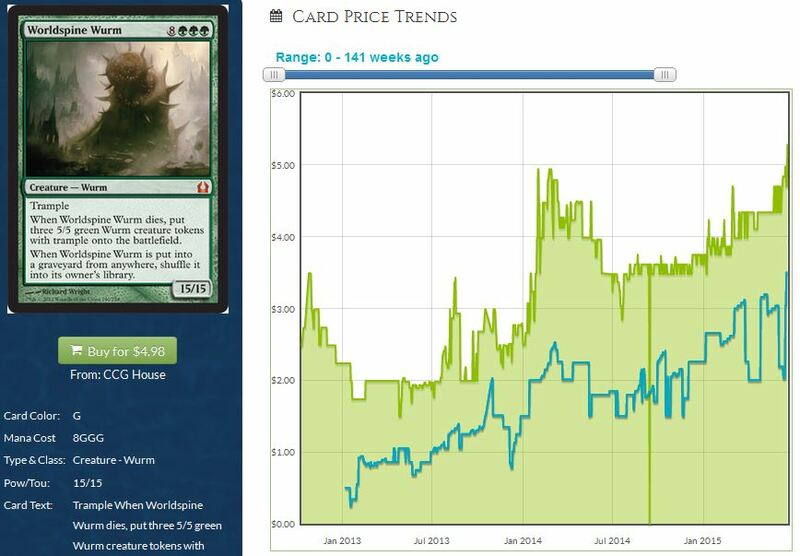 Wurmcoil Engine’s price took a hit when it appeared in a Commander product. But since bottoming out last winter, the artifact creature has steadily risen. Star City Games is sold out of nonfoil copies of the card. That $15.35 price tag could approach $20 before the summer is over, especially if Tron remains popular in Modern. I’m going to go out on a limb here. A while back I noticed SCG was frequently sold out of Power. Every time they would get a Mox in, the card would sold quickly thereafter. Then Star City Games shook the entire Power 9 market by bumping their buy prices up significantly. Since then Power has stuck at a much higher price than before. I’m noticing a very similar trend on A/B Dual Lands. They have almost none in stock, despite their already aggressive buy prices. It would not surprise me to see them move the entire market on A/B Duals in the next 6 months should this trend continue. At least Sig recognizes that this is another US centric article. The foundations are sound, but I wasn’t aware I was paying for info that doesn’t really apply to most of the world. It CAN apply, just in different ways. For example if you’re located in Europe, you could be seeking out opportunities to act as middle man to US buyers. If you’re in Asia, you may be aware of more small-scale shops that sell cards online. Then you could identify buyers in the U.S. and start shipping cards this way. Even if you’re in Canada, you could still take advantage of cheap Yen and/or sell cards to American buyers for profit. In the U.S. we’re in a buyer’s market, but in countries with weakening currency it’s a seller’s market. This is definitely relevant to those outside the U.S. just in an opposite way. Sorry if the article wasn’t readily applicable to your style. But it definitely IS globally relevant – even moreso than other pieces I’ve written. Hope this helps! Thanks for sharing your thoughts. Great article as always, but I do have a question. It’s seems you are pushing people to sell Modern cards now, but what about guys like me that are long-term collectors??? Yes, Snapcaster Mage is a $90 card right now because of the Modern GP’s, but what about a year from now? So many speculators have ideas about what cards will see reprints and what won’t, and for specific reasons. These ideas are a big reason why collecting and speculating is fun, and an awesome hobby. I have collected a lot of Modern staples over the past 6 months, and these are cards that I know won’t see a reprint for a few years. I know nothing is certain, but educated guesses are usually good ones. That’s why I love websites like this one. Your writers are always trying to help people like myself in anyway possible. Getting to the point….. If you’re for short-term gains then yes, sell your Modern staples now. If you’re a long-term speculator like me, then I say be patient and wait atleast a year from now to see what the next Modern season brings. I certainly don’t blame you for wanting to hold Snapcasters. He’s too powerful to appear in Standard again, so playing the odds it’s likely we won’t see him for quite some time. This is true statement. I don’t see Snapcaster going much higher from here, at least not this summer. So you could hold and hope to see $120 next year, but the longer you have to hold the more risk you’re taking for small gains. We’ve already seen the card triple in price. Rather than sit and wait for another $20, wouldn’t it be better to park money elsewhere? That’s just the question I ask myself all the time. Being so risk averse, it just feels like if I’m going to park money for long term I’d rather be in older, reserve list staples. It’s just my style. But many others have different styles. They CAN stomach some risk. By no means are my suggestions the best for everybody. But I’ve found they work for me so I share these ideas as just that – ideas to consider. It’s why we have a diverse group of writers on the site – so that readers can have access to many varying opinions. Thanks for your questions, and for your kind words!!! As always, another marvellous read Sig. You guys have it lucky there in the U.S.! I recall seeing Sword of Fire and Ice being listed on MKM for way below market price a while ago due to the strength of the Dollar in relation to the Euro and it’s nice to know that it wasn’t an isolate arbitrage opportunity. Also thank you pointing out the site to look up on misspells. That is just the tool I need to find for ‘Liliana of the Vale’. Thanks for commenting! It definitely wasn’t an isolated arbitrage find. This is a global trend, and it’s actually worsening as we speak. The whole situation in Greece has thus far been a drag on the Euro, making MKM purchases more and more favorable. 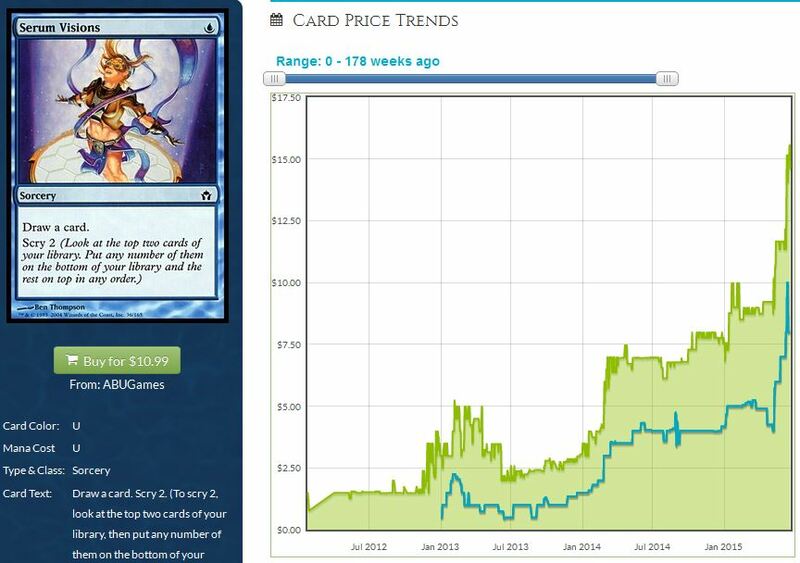 It’s a fascinating trend with profound impacts on the MTG market that many people may overlook. Love your misspelling idea! There are so many possibilities for this tool, and I’ve only begun to scratch the surface :).